As our premier collection of heavy-duty, real-wood veneered modular bedroom and occasional furniture, Solstice is available in three luxurious wood finishes – Maple, Black Walnut and White Oak. With Solstice, you’ll have access to a vast range of options covering all possible configurations and sizes. 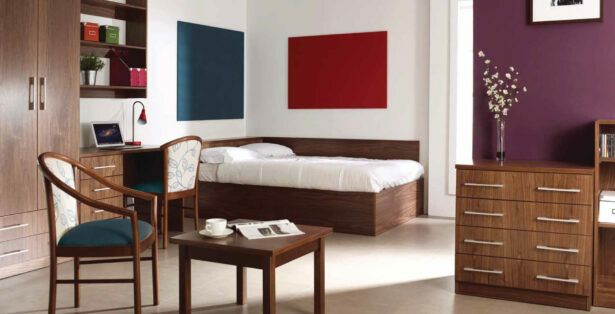 As a genuinely modular range, it is available as free-standing or as a fitted option. In consultation with you, we’ll create special designs or layouts to suit your room layouts. With wood veneer and solid timber lipping in each finish, you’re assured of elegance and outstanding performance. 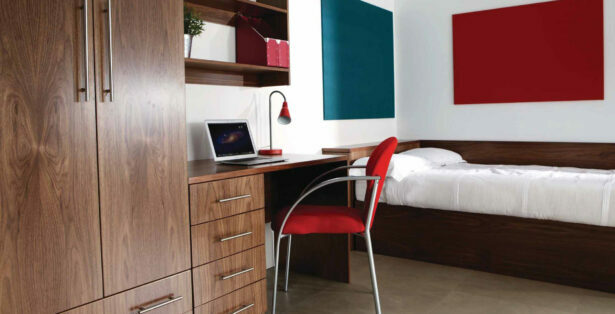 Our lightest real wood veneer, Lightwood Maple is ideal for use in student accommodation. 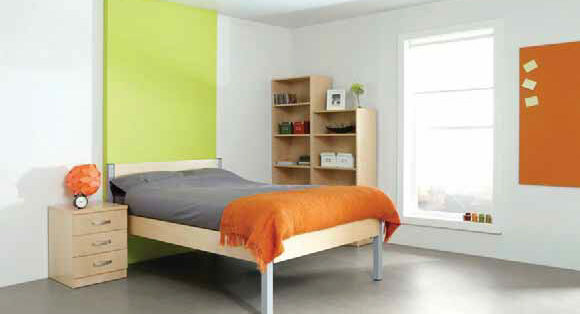 The light reflective finish gives small rooms a greater sense of space. It works as an ideal conference and budget hotel range. And by combining bright silver or graphite metal-work found with products like beds or desk frames, we can create a stunning visual design, adding genuine freshness to any living space. The richness and warmth of our Solstice range in Black Walnut contrasts significantly with our Lightwood Maple, and it has the ability to add depth and character to any interior design. This depth makes it an ideal option for conference accommodation and we have also designed and supplied Solstice in this finish to many clients in the care home sector. There is a character and comfort in White Oak that simply cannot be found elsewhere. For many years, it has been the finish of choice for designers and design professionals. Solstice in White Oak will give your interiors exclusivity and quality, giving you superb finishes at exceptional prices.